Agilent Technologies Inc. (NYSE: A) recently announced that it received Frost & Sullivan's Global Company of the Year Award for radio-frequency test equipment. Engineers in RF design, R&D and manufacturing face continuously emerging test challenges driven by increasingly complex modulation schemes, an ever-growing number of industry standards, wider information bandwidths, and new frequency bands and applications. They use Agilent's spectrum, signal and network analyzers to design, test, and maintain RF and microwave electrical components, circuitry and equipment, particularly in wireless communications. "Our unique research philosophy enables us to determine how best-in-class companies worldwide manage growth, innovation and leadership," said Frost & Sullivan industry analyst Prathima Bommakanti. "We are pleased to give Agilent this award recognition. Agilent has consistently maintained its position as the dominant player in the global RF test equipment market. It offers a broad range of products of both traditional and modular test equipment. Its success can be primarily attributed to a first-to-market position and a genuine focus on delivering the most value to its customers through a close working relationship with them." "It is exciting to receive this level of global recognition for our RF test leadership," said Andy Botka, Agilent's microwave and communications general manager and vice president. "We work closely with our customers to support their need to turn ideas into validated products as quickly and reliably as possible. They expect their test equipment to provide enough flexibility to accelerate measurement insight and support industry standards while maintaining the highest level of measurement integrity." "Agilent's position in the market can be primarily attributed to its technological brilliance and its strong customer-focused approach," Bommakanti said. "A key strategy of Agilent to maintain its share in the global market has been to provide a complete product portfolio with multiple performance price points that each run common application software, plus delivering complete solutions verses independent components. Agilent's approach couples flexibility with a clear focus on accelerating measurement insight and maintaining measurement integrity." 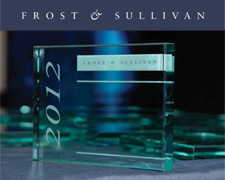 Additional information on the Frost & Sullivan award can be found at www.agilent.com/find/RFAward_backgrounder. Agilent's complete offering of RF software and handheld, benchtop and modular equipment can be found at www.agilent.com/find/RFandMicrowave. Agilent Technologies Inc. (NYSE: A) is the world's premier measurement company and a technology leader in chemical analysis, life sciences, diagnostics, electronics and communications. The company's 20,500 employees serve customers in more than 100 countries. Agilent had revenues of $6.9 billion in fiscal 2012. Information about Agilent is available at www.agilent.com. measuremenTest.com - your test and measurement online resource. Powered by Blogger.